The Block Museum of Art at Northwestern University will host a week-long gathering of six archaeologists from Mali, Morocco, the U.K. and the U.S., working at the cutting-edge of research on medieval Africa. The unprecedented gathering April 22 to 26 will bring this group of international scholars together for the first time to share their new findings about Africa’s understudied medieval period with public audiences. The research points to Africa’s participation in extensive trade and global interconnections in the eighth to 16th centuries. The assembly of archeologists coincides with The Block’s exhibition “Caravans of Gold, Fragments in Time: Art, Culture and Exchange across Medieval Sharan Africa”, the first major exhibition addressing the scope of Saharan trade and the shared history of West Africa, the Middle East, North Africa and Europe in the medieval period. The participants have been advisors to the exhibition and are featured in videos throughout the exhibition. Several also wrote essays for the exhibition companion publication. Public programs include “From the Field – International Archaeologists in Conversation” at 6 p.m. on April 24 and a full-day symposium entitled “Trans-Saharan Exchange and the Global Medieval: Visual and Cultural Studies Research at the Crossroads of Disciplines and Regions” hosted by Northwestern’s department of art history and The Block. “While ‘Caravans of Gold, Fragments in Time’ focuses on a past that may seem remote, it could not be more timely or more relevant to the Block’s mission — to be a place in which art is a spring¬board for discussion of issues and ideas that matter now,” said Lisa Corrin, the Ellen Philips Katz Director of the Block Museum. “We are honored to have these preeminent archaeologists assembled at the museum to share their new research with the public and with one another, research that urgently asks us to question our assumptions about Africa and its place in history,” Corrin said. “‘Caravans of Gold’ makes the past tangible through rare fragmented remains that were excavated from key archaeological sites around the Sahara, sites that were once thriving cities and towns involved in long distance commerce,” said exhibition curator Kathleen Bickford Berzock, the Block Museum associate director of curatorial affairs. “The groundbreaking work of these archaeologists is at the heart of the project. Poring over reports of sites excavated by them, I was struck by the variety of commercial goods taken out of the ground, and by their ties to far-reaching networks of exchange that stretched in multiple directions,” Berzock said. The archaeologists will participate in a number of campus conversations during their week at Northwestern, including visits with the department of anthropology and the program of African studies to discuss current issues in the field of archaeology, expansion of research within medieval African archaeology, the challenges of African field-work and potential alignments in discoveries from diverse sites. They also will participate in an interdisciplinary workshop for undergraduate and graduate students and faculty from across departments including English, comparative literature, poetry and poetics, performance studies, material sciences and design. The program will foreground the ways in which archaeologists can draw far-reaching connections from localized and fragmentary material remains. During the week the scholars will visit local public schools, joining students in classroom discussions about the science of archaeology and how archaeologists learn about the long history of African trade. For K to 12 education resources and more information on the exhibition, visit the “Caravans of Gold” companion website. 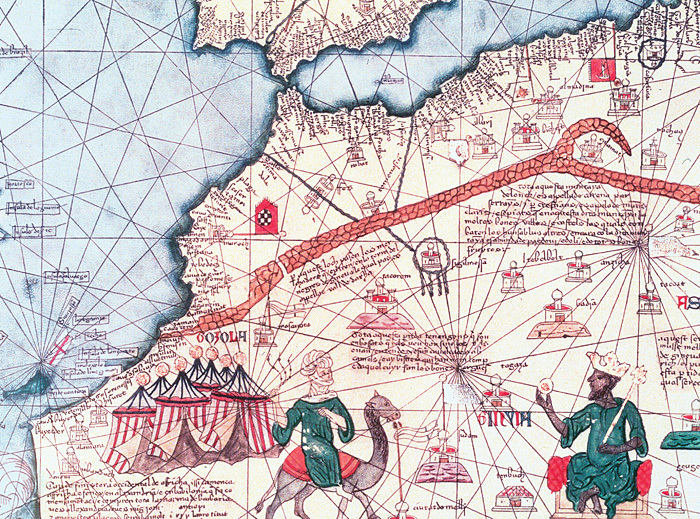 Top Image: Map of West Africa in The Catalan Atlas (1375).